Ape Escape 2[a] is a platform video game developed and published by Sony Computer Entertainment for the PlayStation 2 video game console. It is the second game in the Ape Escape series, and is also used as the basis for the cartoon series by Frederator. Ape Escape 2, like its predecessor, is a platform game in which players control Hikaru as he catches monkeys spread across each level. Like the previous game, players control Hikaru using the left analogue stick and shoulder buttons while using the right analogue stick to control various Gotcha Gadgets that are unlocked as the player progresses through the game. Along with returning gadgets such as the Stun Club, Monkey Net, and Dash Hoop, Ape Escape 2 introduces three new gadgets; the Bananarang, which attracts monkeys with its scent, the Water Cannon, which puts out fires, and the Electro Magnet, which can be used on magnetic surfaces. New to the game is the monkey sidekick, Pipotchi, who accompanies Hikaru through most of the game. While with Hikaru, Pipotchi can give the player hints, help Hikaru reach ledges, and revive him when he gets knocked out. Throughout the game, players can collect gold coins, which become more valuable when collected in quick succession. These coins can be spent on the Gotcha Box gashapon machine to unlock bonus material. Along with various collectibles such as concept art, music, comic strips, and fables, players can unlock three brand new minigames; Monkey Football, Dance Monkey Dance, and Monkey Climber, which can be played with up to two players. Monkey Football is a football game, Monkey Dance is a rhythm game requiring players to match dance moves to the rhythm, and Monkey Climber is a challenging game requiring players to navigate a monkey across vines. Completing the game unlocks a New Game+ mode in which players can play as the previous game's hero, Kakeru. The game takes place after the events in Ape Escape, where Kakeru (Spike in the English versions) stopped Specter from taking over the world. It is a few years later, and the Professor left for a vacation leaving his granddaughter, Natsumi (Natalie in the U.S. version), and Spike's cousin, Hikaru (Jimmy in the U.S. version), to watch over the laboratory. The Professor has left them with one task: deliver a load of monkey pants to the monkeys in Monkey Park. Hikaru accidentally sends not only the monkey pants, but some Monkey Helmets as well, wrecking the laboratory in the process. Specter gets a hold of one, and yet again makes an army of monkeys bent on ruling the world. Under Natsumi's orders, Hikaru aims to capture all the monkeys and stop Specter (due to the mess-up from earlier). However, Specter has supplied five monkeys, the Freaky Monkey Five, with Vita-Z bananas, making them stronger and more intelligent than the average monkeys. Hikaru manages to capture all of the Freaky Monkey Five, except Yellow Monkey. Before his fight with White Monkey, Pipotchi, a baby monkey accompanying Hikaru, is kidnapped, in order to transfer the data in his Monkey Helmet (a re-engineered model which makes Pipotchi friendly) into a device called the Lethargy Laser. Rescuing Pipotchi, Hikaru makes his way through a monkey controlled military base, and confronts Specter, who is waiting for him with a redesigned version of his battle cruiser from the first game. Before the two can battle, Yellow Monkey, now a giant monster thanks to an overdose of Vita-Z bananas attacks the facility. Specter flees, and Hikaru manages to downsize and capture Yellow. Hikaru, the Professor and Natsumi then discover the purpose of the Lethargy Laser. By firing it at the globe, all humans worldwide will lose the will to fight back, making it easier for Specter and the monkeys to take over the world. Hikaru confronts Specter at his moonbase, who attacks him with a giant robot. Once defeated, Specter attempts to fire the laser, but Hikaru states that humans will never give up, and captures him. Hikaru and Pipotchi then flee the exploding moonbase. Shortly afterwards, Specter escapes and goes into hiding. Hikaru then proceeds to capture all the remaining monkeys before the Professor discovers Specter's hiding place. Hikaru warps there, encountering Specter, and the two of them battle again. Specter loses and is once again captured. The game ends with Kakeru visiting the laboratory, which is again destroyed when Hikaru accidentally crashes a spaceship into it. On release, Famitsu magazine scored the game a 32 out of 40. Kotaku praised the game citing the PlayStation 4 port which was released on PSN in August 2016. ^ "ae2_en_phase1.swf Archived July 7, 2011, at the Wayback Machine." 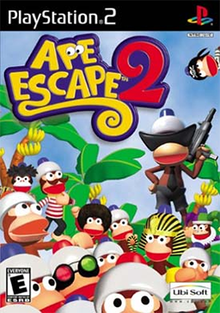 Ape Escape 2. Retrieved on December 4, 2009. ^ "Ape Escape 2 joins the PS2 classics library on PS4". Polygon. 2016-08-02. Retrieved 2017-05-03. ^ プレイステーション2 - サルゲッチュ2. Weekly Famitsu. No.915 Pt.2. Pg.78. 30 June 2006. ^ Sang, Narelle Ho. "Ape Escape 2 Is Better Than I Remember". Kotaku. Retrieved 2017-05-03.